"But Sauron in his tower was aware of them, and doubt took him; for they went in haste, and stayed not to report their deeds, as was commanded to all the servants of Morgoth that passed that way. Therefore he sent to waylay them, and bring them before him. "Thus befell the contest of Sauron and Felagund which is renowned. For Felagund strove with Sauron in songs of power, and the power of the King was very great; but Sauron had the mastery, as is told in the Lay of Leithian"
Yeah so, basically how everybody else envisioned this going down, right? 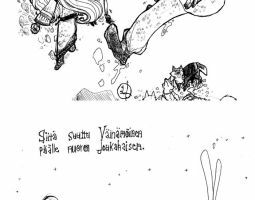 To those who don't know this is a reference to the Kalevala Kilpalaulanta were Tolkien take much inspiration for his own work. It definitely feels like an accomplishment to hear somebody say they will imagine this when they read that part! I'm really glad you like it - thank you very much! I really appreciate that you said something about that cause I debated whether to include it or not since I wasn't sure if that was a little much. But the whole thing is a little much, so I decided to go with it. And I'm glad, since it obviously amused you. XD Heheee... I'm so happy with your reaction! YES I really don't think it would've been complete without it. Haha, it's amazing how something so silly and lighthearted can resonate so much, and even just bring me a smile on a tough day! I'm not sure if you mean this is not how you expected the scene to be in the book, or not what you expected the picture to be. Either way, valid. LOL they look so cute! Well, fortunately the comic ends before things get decidedly not cute haha. Glad you like it!